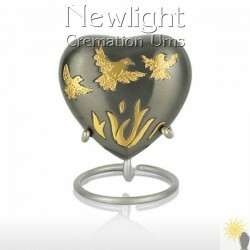 The Rydale ashes casket is a very high quality solid wood cremation casket. It is finished to the highest standards by genuine craftsmen who have lavished a great attention to detail on this beautiful urn. The Rydale casket is made of oak and has the smooth, warm, tactile qualities you only get from wood. The Rydale is one of our more economic ashes caskets and yet still boasts all the same craftsmanship as our other urns. It has a striking design with attractive tapered and raised side panels. Access into the urn is gained through the bottom which is held in place with screws. 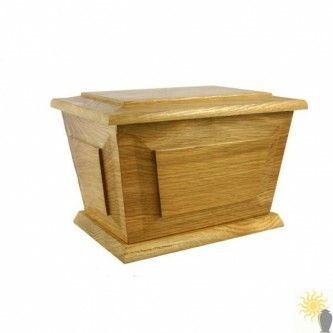 It's important to mention that this is a substantial, premium quality wooden urn and not to be mistaken for the cheaper caskets that are available elsewhere. All this wonderful detailing makes this urn one of the most luxurious available and is designed to be suitable for the ashes of an adult. This work is real hand craftsmanship and great care has been taken selecting the ashes caskets for our collection, so when compared side by side with others you will instantly see and feel the superior quality of our caskets. No matter how good the photographs, they can never do justice to the wonderful hand craftsmanship that you will find on every Newlight Cremation Casket.